Item is used in part 5 of the composition and indicates that a selected instrument group (string quintet, percussion, voice, sax quartet, or wind quintet) should move through all of the musical possibilities available. 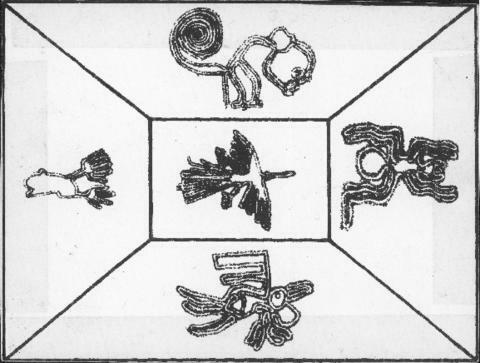 The possibilities are indicated by five graphic representations of geoglyphs in the Nazca Desert, Peru, including the monkey, spider, pelican, hands, and condor. Each image translates to a type of articulation: the monkey is fragmented and active; the spider is dense and active; the pelican is slow and sustained; the hands indicate extremes of range; and the condor indicates that the musicians should mimic the improvisations of their colleagues. The flashcard is-double sided.